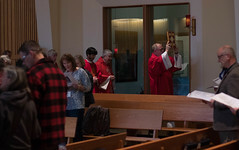 Last year, in anticipation of our first Easter season in the Catholic Church, I polled my friends about what to expect from the various special activities and Mass times I saw listed in the bulletin. Honestly, I was more than a little overwhelmed by the number of options! Some of my friends expressed that even though they were cradle Catholics, there were certain Holy Week gatherings that they had never attended and Lenten traditions that they had yet to adopt. Some were a little abashed that they couldn’t give me better advice, but I found their candidness comforting. It was a good reminder that this journey isn’t over until it’s over; we each have an infinite number of ways to grow and learn still ahead of us. We have four young children and decided to keep it pretty simple last year. 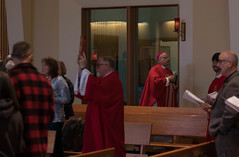 We attended Good Friday and the Easter Vigil and focused on family discussions and devotions at home that built anticipation for the celebration of Christ’s resurrection. This year, I feel more prepared to make room for a more intentional Holy Week. I’ve taken time to read a bit about the many ways the Church has historically used Holy Week as a way to walk through and remember the last events in Christ’s life. Palm Sunday through Easter (and beyond) we can in some small ways share these moments with our Savior! She remembers many special moments from her childhood like long pilgrimages to the Shrine of St. Therese for the Stations of the Cross, darkening their home and wearing black on Good Friday, and sleepy Easter Vigils. Talking with her always renews my commitment to fully include my children in memory-making. My friend Kayla Smith remembers the sixth-grade teacher who first challenged her to attend the Triduum, and especially enjoys Eucharistic Adoration after Holy Thursday. She says, “It is incredible to see so many gathered to spend an hour – or whatever they can – with Jesus in the Blessed Sacrament in the middle of the night.” Kayla also jokingly remembers how keeping the TV off until after the Good Friday service almost killed them as kids, and how much she came to appreciate the silence and time for reflection. I have loved hearing all of these ideas and seeing a theme in the fondest memories. Holy Week doesn’t have to be a time to scramble to check more boxes on our liturgical living to-do list. It’s certainly a full week, but it’s not about busyness. Holy Week is different because we are taking time to celebrate the past, and yet all of the emphasis is on being very – even uncomfortably – present in God’s story. It’s an in-between place – it doesn’t feel very normal to be purposefully somber while still sensing the burst of great joy that we know is coming. It’s an already, but not yet, kind of time. A time to set aside many of our day-to-day concerns and routines and re-align ourselves to our identity as Christ-followers – a set-apart people redeemed by the God who writes the best surprise endings.